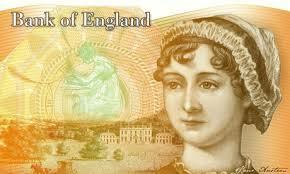 I am so pleased to hear the news that the Bank of England has agreed to put a woman, Jane Austen, on the new £10 bank note. 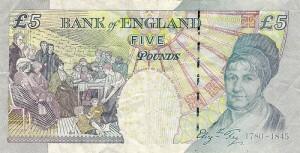 Currently there is only one woman represented on Bank of England notes (Scotland have their own), and she is due to be removed, yet a large part of me is muttering what the hell is going on? I supported the campaign wholeheartedly (I even donated twice!) but I just can’t believe that at 57 I am still fighting for things like that. When I was 14 and first became truly aware of feminism I really thought such battles would be a thing of the past at this stage of my life. Why, in 2013 did we need a campaign to persuade the bank of England that taking the only woman off the notes (Elizabeth Fry pictured above) and replacing her with Winston Churchill was misogynist and just plain wrong! It wasn’t like they just said, Oh dear, how stupid of us, we didn’t think and we’ll rectify that immediately. No, it needed an enormous amount of pressure, orchestrated in the main by The Women’s Room ‘s Caroline Criado-Perez to get them to change their minds. Plus a lot of bad publicity, and a change of Governor. If anyone still thinks why do we need feminism in this day and age I refer to them this campaign. Can you imagine such a campaign happening in a gender equal world? No, me neither. Study after study points to women’s lack of confidence as a significant factor in them not getting to senior positions. It’s not surprising when we live in a world where women are still treated as an afterthought and subject to thoughtless sexist remarks and attitudes on a daily basis. So huge congratulations to women like Caroline and Catherine Smith who don’t just moan but galvanise the rest of us into rising up. I can’t wait to hear what their next campaign will be. Well done, Caroline and The Women’s Room folk. I am so pleased to be associated with you! Lang may yer lums reek! You are brilliant role models! Keep carrying on!